Choose from a market leading selection of pool & snooker table lighting. Full range of sizes, colours and types available. All come with free delivery. Pool table lighting is a necessity for anyone looking to get serious about their pool or snooker game. At Home Leisure Direct we have a fantastic range of lighting to accompany your pool table, in a variety of colours and styles to meet your needs. We offer chrome and brass bar-style lights with a choice of shade colours. These hang directly above the table and illuminate all corners, giving you the best view of the balls and helping you to play your best shots. 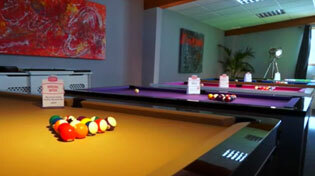 We also have pool hall professional-style lighting and competition pool and snooker lights, as well as light canopies. Whatever type of lighting you want for your table, Home Leisure Direct will have what you need. The most common arrangement for pool table lighting is a single horizontal bar, with three or four lights hanging underneath and covered by shades. The bar is usually made from chrome or brass, though brushed chrome and wood are also occasionally used. We offer a variety of shades in shapes such as bowl and pyramid, and in colours such as green and blue. Other lighting configurations have a large single strip light across the table, giving a more even glow at the same time as offering a different style for your pool or snooker room. These come in a range of sizes to accommodate different tables, as well as varying colours to match your décor. We have lights designed to illuminate 6ft, 7ft, 8ft, 9ft, 10ft and 12ft tables, which encompasses virtually all sizes of pool and snooker table available on the market. All of our pool table lights come with free delivery to mainland UK. However, for locations outside the UK mainland there may be an additional charge depending upon your exact location. Please call our friendly customer service team on 0800 622 6464 for a quote. We only stock lights made by expert manufacturers, and crafted using the finest selected materials. Our pool lights are all made by craftsmen, so when you buy a covers from Home Leisure Direct, you know you're getting the very best. Visit our Pool Table Showroom to look at a superb collection of pool lights, try them out and get some first hand advice on the right one for you. Our friendly staff are always on-hand to point you in the right direction for your perfect pool tables, lights and other accessories. If you're looking for a new cue to go with your new pool table lights, we have over 150 cues in stock, in both American and English styles. At our showroom you can try out our selection, on any of our huge number of playable tables. We also stock rests and extensions. If there is a particular cue you require, please call us on 0800 622 6464 or 01454 413636 before you travel, as our stock changes daily.